It's baaaack! It's time once again to gauge the hotness of our favorite Big Ten coaches' butts going into the 2014 season. This is a time-honored tradition for this blog, and 2014 looks like it's going to be a very interesting year. This time, we have some fancy new divisions to show off. The Big Ten has realigned into two more directionally-relevant divisions...east and west. Just draw a line right down the middle of the rust belt. Simple, concise...right to the point. And, we also welcome two east coast schools into the B1G mix...Rutgers and Maryland. Totally Safe - Can literally lose every game and still be elected governor. Needs a Good Year - Needs to improve from 2013. Needs a Great Year - 2014 could be the end if things don't get better fast. Dead Man Walking - The end is near. Life is tough for college football coaches. But life is a little tougher at places like Indiana, who's fans are used to bad football teams and struggling coaches. Wilson enters year 4 with an overall record of 10-26...which is bad when viewed from the perspective that this a major college football conference and football steers the ship. But Indiana is going to Indiana...it's all about basketball. Which means football takes a back seat. Wilson hired a new defensive coordinator for 2014, Brian Knorr. Much like how Brady Hoke's fate is now tied to new OC Doug Nussmeier, Wilson will sink or swim depending if Knorr can save the dismal IU defense from remaining one of the worst units in the conference. There's no question the Hoosiers can score some points. But stopping teams is just as, if not more important. But new for 2014 are the east and west divisions. And the Hoosiers find themselves in the top-heavy east division along with conference front-runners Ohio State and Michigan State. As well of course are Michigan and Penn State. So Wilson and his new DC are going to have their hands full, but as it was a year ago, it should at least be fun to watch. Hey, I know this guy! Michigan played him back when he was the head ball coach at UConn in 2010. That year he won the Big East and took his Huskies to the Fiesta Bowl. But more importantly, he got offered the gig at Maryland the next year. In three years, Edsall has taken the lowly Terrapins from 2-10 to 4-8 to 7-6. A worthy turnaround, no doubt. But as Maryland now enters the Big Ten's stacked east division, who knows how the former ACC squad will perform. Edsall likes the challenge and certainly doesn't expect UM to be just a feeder fish for the B1G, he expects to compete...and so do I. The schedule is going to be tough. They get West Virginia and Syracuse as non-conference foes, of course the tough B1G east teams on the schedule, but they also get Iowa and @Wisconsin as crossover opponents. But all that said, expect Maryland to play tough. They're going to surprise some folks. Year 4 for Brady Hoke is going to be a defining one. 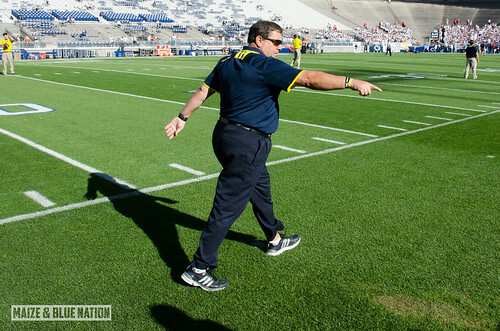 Hoke has made no mystery that he expects to win championships at Michigan. His goal every year is a B1G title and to go to the Rose Bowl. After a surprisingly good year 1 in Ann Arbor, it looked like he was going to deliver on his promise. But two struggling seasons later, and Michigan is no closer to a Rose Bowl than they were during the Rich Rodriguez era. Hoke replaced offensive coordinator Al Borges with Doug Nussmeier from Alabama. Nussmeier inherits a young but talented offense that drastically underperformed last season. How well the offense competes this season, more importantly how well the OL comes together to rejuvenate Michigan's anemic running game will go a long way in determining how long Hoke will be welcome in Ann Arbor. Hoke's fate is now tied to Doug Nussmeier. The schedule is tough with every marquee rivalry game on the road, where Hoke has struggled. But overall the schedule isn't any tougher than it's been the last couple of years. Michigan fans are tired of hearing excuses. Its time to win big games. 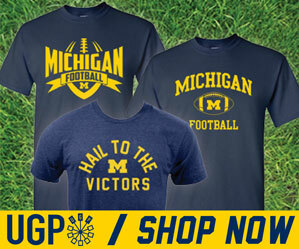 Do I think 2014 is a do-or-die year for Hoke at Michigan? No I don't. But I do think the heat has been turned up substantially. Its all about keeping up with the Joneses, and by that I mean Urban Meyer and Mark Dantonio. Brady Hoke needs to bring Michigan back to the big boy's table and start hoisting some trophies. And soon. Could 2013 been any better for Michigan State and Mark Dantonio? Well, take away the 17-13 loss in South Bend and it could've. But going 13-1, beating Ohio State to win the Big Ten and then beating Stanford to win the Rose Bowl is about as glorious a season fans have ever seen in East Lansing. Am I alone in wanting to see Michigan State and Florida State play for a BCS title? What a game that could've been. Dantonio took 7 years to bring a B1G title to Michigan State, but I think if you asked Sparty fans if they thought it was worth the wait, they'd unanimously agree that it was. From the start, Dantonio has been well liked by MSU fans. He hates Michigan just so damn much. And for 6 years, it was nice to renew the rivalry again. But now that Mark has delivered something that the last 2 Michigan coaches haven't, a B1G title and a Rose Bowl win, there's a new found respect for what's going on in East Lansing. Mark Dantonio cemented his Spartan legacy last year. Michigan fans are hoping for the kind of jump Michigan State had from 2012 to 2013...7-6 to 13-1. Dantonio showed that it can be done. Now he must do something no Michigan State coach has done since 1987 and George Perles...defend an outright Big Ten title. That's how most Ohio State fans view Urban Meyer. And with his combined 2-year record of 24-2, he's certainly worthy of such high praise. But if the last two games, losses to Michigan State and Clemson are any indicator, then the road is getting a little tougher for Meyer in Columbus. Ohio State always has a bullseye painted on it's back. That's what happens when you're one of college football's most marquee programs. But the way in which the 2013 season ended left the Buckeye faithful a little deflated. A Big Ten title was all but assured according to folks in Columbus. Buckeyes had their trips to Pasadena booked well in advance. After a narrow 1-point win against a battered Michigan team, a heartbreaking loss to Michigan State and another tight loss in the bowl against Clemson, its clear that all is not perfect in mid-Ohio. That said, until I see this trend continue, Ohio State is still a front-runner for the Big Ten title. Elite coaching and elite talent is something you just can't ignore. Is the defense a liability? I think it's a huge one. Is there an insurance QB with good experience for when Braxton gets injured? Can they replace Carlos Hyde and 4 starters along the OL? Who knows. But this is Ohio State, and they seem to just roll with the punches better than most places. But I will guarantee you right here that they will not finish the regular season without a loss. Urban Meyer must focus is efforts on the defense. Giving up an average of 32.8 ppg over their last 5 games is not going to win championships. I'll be honest with you. I know zero about James Franklin. What I do know is he's one of the highest paid coaches in not only the Big Ten, but the country. And this is only his 4th year as a college head coach. Not bad. I also know that he has some major shoes to fill. Both of Bill O'Brien and Joe Paterno. Two guys who were overwhelming fan favorites by the Penn State fan base. So far, they seem to be embracing Franklin...who has nabbed some pretty good recruits in his first few months in Happy Valley. Franklin came from Vanderbilt where he injected some life into the typically mediocre SEC school that never really competed against the brass of the league. But in his last year, he took the Commodores to 9-4 and ended the season on a 5-game winning streak and a win in the BBVA Compass Bowl. The oldest college football program in the country is in a bit of a transitional period. Kyle Flood has the unenviable task of following up Greg Schiano's 10-year stint that rejuvenated the Rutgers football program...and ultimately landed them in the Big Ten. 2013 was a tough year for the Scarlet Knights in the ho-hum American Athletic Conference. Wins over SMU, Temple and South Florida are hardly impressive. And now those AAC lame ducks have been replaced with trips to Columbus, East Lansing and Lincoln. As well as visits from Michigan, Penn State and Wisconsin. Rutgers may just have the toughest schedule in the league this season. The cost of doing business in Piscataway just went up dramatically...which I think gives Flood a pass for 2014. Check back soon for our west division hot seat post.